You are here: Home / Energy and Environment / Setting climate targets: when is net zero really net zero? ‘Net zero’ and ‘carbon neutral’ have quickly become the go-to phrases for ambitious declarations on climate change action. But what do ‘net zero’, ‘zero carbon’ or ‘carbon neutral’ actually mean in practice? As climate action targets are increasingly announced both locally and nationally, it’s even more important that the assumptions involved are properly understood to deliver on the aspirations set out in the Paris Agreement. So what does ‘net zero’ actually mean? Which gases are included (or not)? How are boundaries set? And what are the different time scales? Here, researchers at The University of Manchester and Tyndall Centre for Climate Change Research set out a consistent and operational approach for policymakers to help avoid falling into the ‘net zero’ carbon jargon trap. Defining terms such as net zero and carbon neutrality is not straightforward. Carbon neutral, climate neutral, net zero, zero emissions and decarbonisation have all been used interchangeably. Which greenhouse gas emissions are included (all, only long-lived gases, only CO2). Whether and how offsetting is included. Which sectors are included (aviation, shipping, heating etc.). Enabling local authorities to set and, more importantly, deliver their own targets using a CO2-focused approach would allow the development of a consistent and comparable approach across the national administrative areas. The current interest in net zero and carbon neutrality originates from the pledge in the 2015 Paris Agreement to keep the global rise in average temperature “well below 2°C and pursue efforts to limit it to 1.5°C”. In addition, the emphasis on ‘net zero’ emissions within the IPCC 1.5°C special report increased the pressure for new policy targets which embrace this concept at national, regional and local scales. Defining terms such as net zero and carbon neutrality is, however, not straightforward. Carbon neutral, climate neutral, net zero, zero emissions and decarbonisation have all been used interchangeably within both academic and policy discussions. There is a variety of definitions but the three key issues are: which greenhouse gas emissions (GHGs) are included (all, only long-lived gases, only CO2 etc. ), whether and how offsetting is included and which sectors are included. A lack of clarity on the scope of GHGs covered and the methodology used to set climate targets could lead to inconsistencies in emissions accounting, system definition and boundaries. All this means that even though local or national net-zero targets may be achieved – this doesn’t necessarily mean ‘zero emissions’ globally. 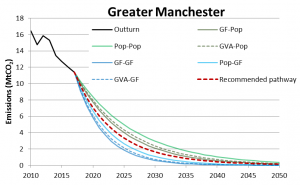 In the UK, Manchester has formally adopted an ambition to become a zero carbon city by 2038, covering CO2 only emissions from energy related sectors (heating, electricity, industry and surface transport) with separate targets for aviation and shipping at national level. This variation in the detail and specific definition of what is covered becomes important when analysing climate commitments and policy statements. For example, unlike (absolute) zero emissions, ‘net zero’ or ‘carbon neutral’ implies some carbon/GHG emissions remain but allows for some form of offsetting through carbon dioxide removal or ‘negative emissions’ for example using biomass energy with carbon capture and storage. Consequently, achieving genuine net zero emissions depends on a tight definition of the boundary within which net zero is to be achieved, and requires proper monitoring. It is not enough simply to define which GHGs are included in a target – the choice of greenhouse gases affects the way in which we can compare the different targets. When all GHGs are included and combined into a single target you come across the problem of having to compare GHGs directly with each other – also known as CO2-equivalence. This is done based on global warming potential (GWP). GWP is a measure of the warming effect of different gases compared to CO2 over a specified amount of time (commonly 20, 100, or 500 years). However, GWP does not adequately take into account the atmospheric lifetime of different gases. For example, although methane has a greater GWP, it has a very short lifetime and doesn’t accumulate in the atmosphere as CO2 does. Hence, when the accounting period is spread over several decades, the climate impacts of different gases is dependent on when emissions occur as well as the magnitude of those emissions. As a result, a single cumulative emission budget or ‘carbon budget’ should be restricted to CO2 alone. In addition to the challenges of measuring and accounting for non-CO2, opportunities for substitution in some sectors, such as agriculture and land use change, are limited. Some energy uses are also easier to abate than others. Electricity, heat, road and rail transport are expected to reach zero emissions before sectors such as aviation, shipping and industrial processes, which have more limited options for mitigation and reducing demand. To achieve global net-zero CO2 emissions, negative emissions approaches may be crucial in offsetting emissions from these ‘hard-to-abate’ sectors. Because CO2 accumulates in the atmosphere over time, the final amount of CO2 in the atmosphere will depend on when net zero is achieved. Every year that passes without substantial and lasting mitigation increases the challenge of staying within the agreed carbon budget, even with the prospect of realising negative CO2 emissions in the future. In the UK, the majority of emissions (77%) arise from the relatively easy to abate sectors using fossil energy which are just CO2. For local policymakers, it makes sense to set targets for these energy-related CO2 emissions (electricity, heat, road transport and industry) which are within the direct influence of local policies. Sectors such as aviation and shipping require coordinated action at national and international level to achieve deep decarbonisation. Enabling local authorities to set and, more importantly, deliver their own targets using a CO2-focused approach would allow the development of a consistent and comparable approach across the national administrative areas. The SCATTER project (‘Setting City and Area Targets and Trajectories for Emissions Reductions’) provides a transparent model to help cities in the UK set zero CO2-only emissions targets from energy related sectors consistent with the Paris Agreement. This allows local authorities to act in line with their aspirations to meet the Paris 2°C temperature objective and play their fair part in global efforts in a way that is measurable without ambiguity. 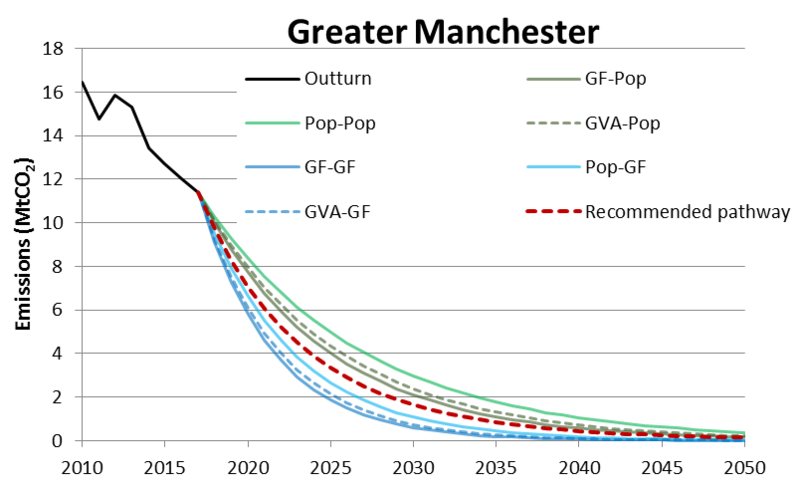 Fossil fuel CO2 emissions pathways for Greater Manchester based on Grandfathering (GF), Population (Pop) and Gross Value Added (GVA) allocations from the UK carbon budget range. Hence, a zero (ideally absolute zero) emissions target for CO2 rather than GHGs, should be the focus for meeting the Paris Agreement goals. This will promote rapid decarbonisation of energy systems with a transparent accounting and verification process which is more straightforward for CO2 than total GHG emissions. The remaining GHGs should not be ignored but should be addressed alongside the main agreement on CO2 reductions both locally and nationally by specifying separate limits for non-CO2 emissions. The task of bringing global CO2 emissions down to genuinely zero levels is immense, even with the possibility of achieving carbon dioxide removal at scale. This will require an ambitious and radical approach to emissions reduction that embraces, but goes beyond, picking the ‘low hanging fruit’; one that actually brings us to zero emissions. Negative emissions may in principle be achieved through land-based measures such as afforestation or through combined technological approaches such as direct air capture and storage or bioenergy with carbon capture and storage. 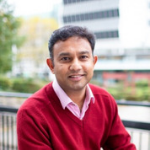 Jaise Kuriakose is a lecturer in Climate Change at the Tyndall Centre for Climate Change, University of Manchester. His research considers carbon budgets and emissions pathways for cities and regions, low carbon energy scenarios compliant with Paris Agreement, operational challenges of electricity grid from high levels of intermittent renewables, resilience of energy systems to changing weather patterns due to climate change and smart grid solutions enhancing operational resilience of electricity grid. Since October 2000 Clair has been part of the Tyndall Centre for Climate Change Research where her research has focused on integrated assessment of carbon dioxide capture and storage. 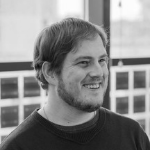 Brendan Moore is a PhD Researcher in the Tyndall Centre and the UEA School of Environmental Sciences. His research focuses on the European Union Emissions Trading System (EU ETS) and its political effects on European climate change policy. He is exploring how the EU ETS's design has had feedback effects on both its development and subsequent attempts at climate policy reform.